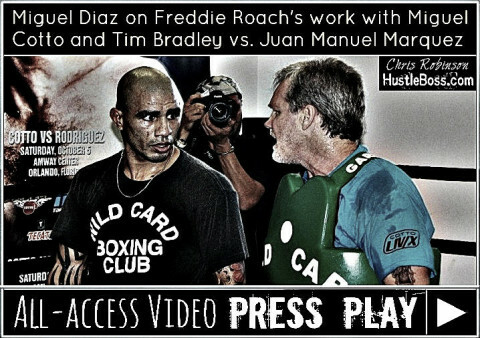 While at yesterday’s media brunch in Los Angeles advance of this weekend’s welterweight title clash between WBO champion Tim Bradley and Mexico City’s Juan Manuel Marquez, Top Rank CEO Bob Arum discussed the future options of Puerto Rico’s Miguel Cotto. This past weekend in Orlando, Fl., Cotto returned to HBO’s airwaves with a scintillating stoppage over Delvin Rodriguez in the third round. Cotto was in rare form, as he ripped the Dominican’s body relentlessly while breaking him down with sharp, powerful blows. 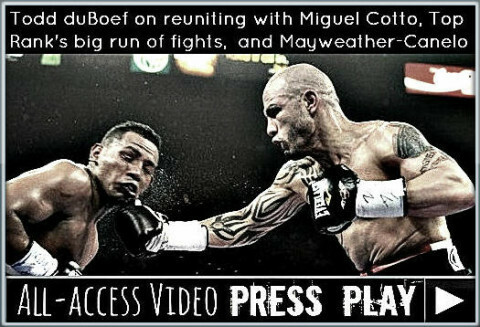 After having two fights co-promoted by Golden Boy Promotions in 2012, Cotto returned to work with Top Rank, his original promoter dating back to his pro debut in 2001, for the Rodriguez match and it looks like a strong possibility that he will finish his career with the company. Arum seemed extremely upbeat when discussing Cotto’s options, pointing towards a match with lineal middleweight champion Sergio Martinez in particular as a fight worth making. 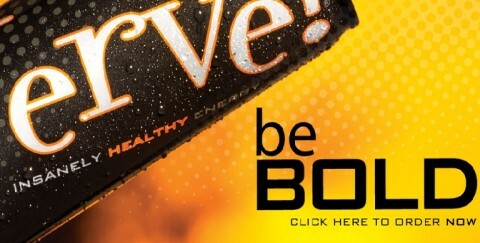 Arum also discussed the possibility of a showdown with former junior middleweight champion Saul ‘Canelo’ Alvarez. 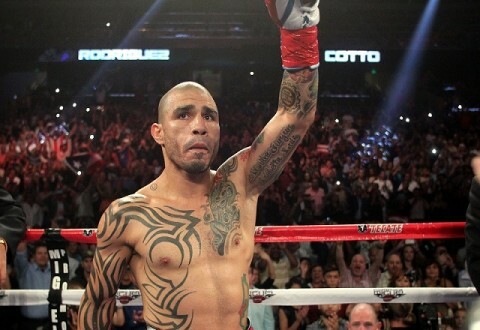 Fresh off of a resounding 3rd round TKO over Delvin Rodriguez this past weekend, Puerto Rican star and former three-division titlist Miguel Cotto’s future looks bright as he enters the final stretch of his illustrious career. 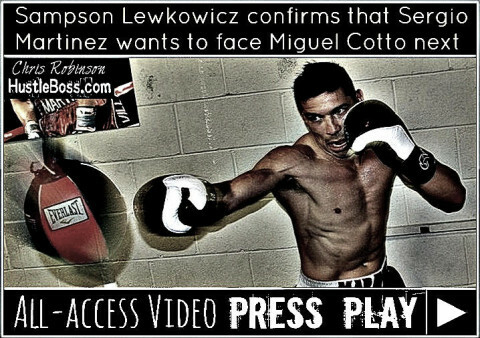 A promotional free agent, Cotto worked with his original promoter Top Rank for the Rodriguez fight after seeing bouts against Floyd Mayweather and Austin Trout in 2012 co-promoted by Golden Boy Promotions. 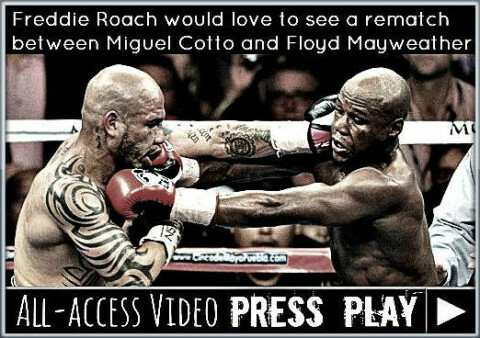 One of the biggest stars in all of boxing, Cotto has the luxury of picking from the most enticing matches available and he certainly seems to have some serious options floating around. I caught up with Top Rank CEO Bob Arum at Monday’s media brunch in Los Angeles in advance of this weekend’s Timothy Bradley-Juan Manuel Marquez pay per view attraction and got his thoughts on Cotto’s choices moving forward. 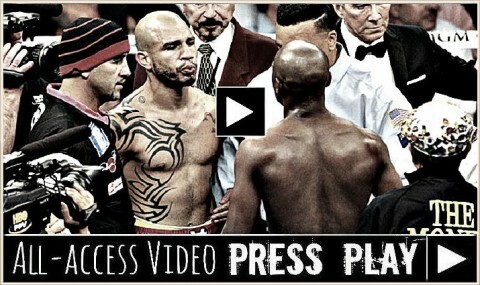 More post-fight coverage after Miguel Cotto’s destructive 3rd round TKO over Delvin Rodriguez on Saturday night, Oct. 5, as his trainer Freddie Roach shares his thoughts on a possible rematch between Cotto and Floyd Mayweather. 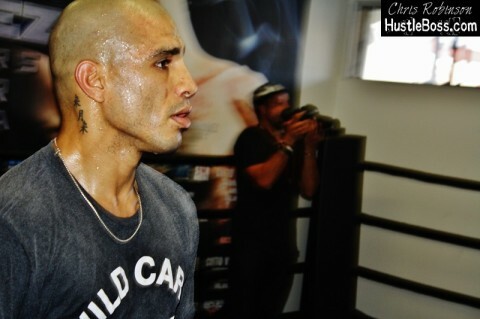 On Wednesday afternoon, Puerto Rican star and three-division world champion Miguel Cotto held an open media workout with his trainer Freddie Roach inside of a newly-renovated gym right beneath the famed Wild Card Boxing Club in Los Angeles. 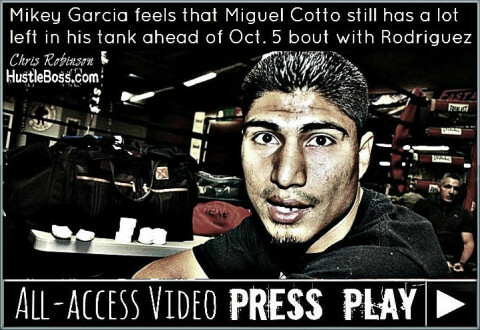 A promotional free agent and one of the biggest attractions in the sport, Cotto is again working with his original promoter Top Rank ahead of his Oct. 5 date against former title challenger Delvin Rodriguez. Cotto vs. Rodriguez isn’t looked at as the most enticing of matchups on paper, and that’s why much of the talk at the open workout seemed to center around Cotto’s options moving forward. 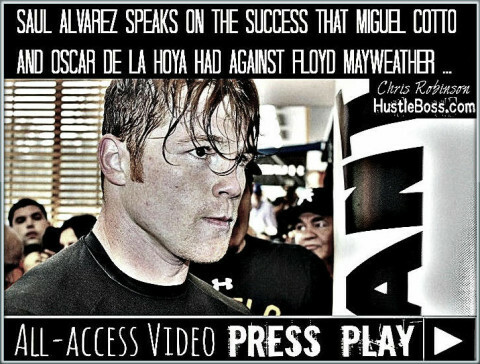 Mexican superstar Saul ‘Canelo’ Alvarez is coming off of a one-sided majority decision loss to Floyd Mayweather this past weekend in Las Vegas, yet he still remains one of the biggest names in the sport and could make for an attractive opponent for Cotto next year. If you are ever looking for a fair, objective opinion on anything related to the sport of boxing, Showtime analyst Al Bernstein will likely fill your void. In a few weeks’ time, Bernstein will find himself sitting ringside inside of the MGM Grand in Las Vegas when WBA/WBC junior middleweight champion Saul ‘Canelo’ Alvarez faces off with Floyd Mayweather, the man widely regarded as the sport’s premier fighter. The opinions on Mayweather-Alvarez have been hot and heavy, with the general consensus being that Floyd’s experience and vast array of skills will be a little too much for his 23-year old foe. When assessing the matchup, Bernstein actually foresees a difficult task on both sides of the fence. Chris Robinson catches up with junior welterweight hopeful Rashad Holloway (12-2-2, 5 KO’s) inside of the Fantasy Springs Casino in Indio, Calif. as he speaks on the recent training of Miguel Cotto at Freddie Roach’s Wild Card gym. 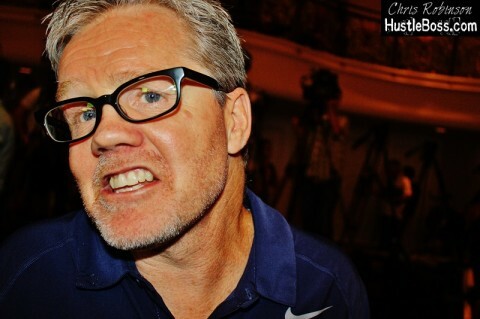 Over the past few weeks, trainer Freddie Roach was able to reconnect with his star fighter Manny Pacquiao during a seven-city international press tour ahead of the Filipino icon’s forthcoming clash with Brandon Rios. 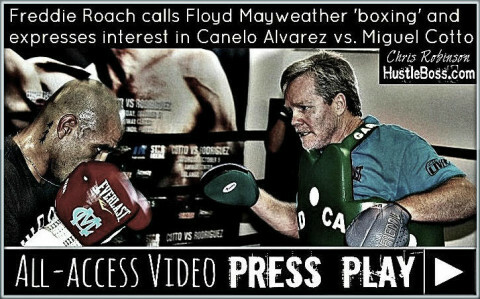 Roach was ringside inside of the MGM Grand in Las Vegas this past December when Pacquiao was knocked out in brutal fashion from a picturesque right hand delivered by Juan Manuel Marquez in the sixth round of their welterweight encounter. 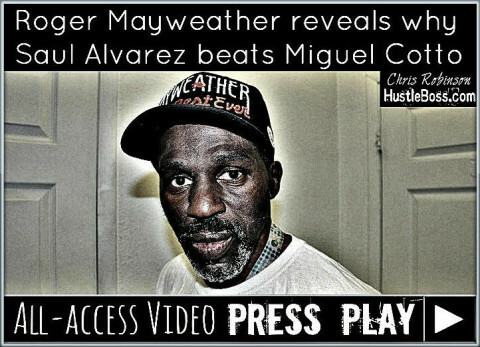 So chilling was Pacquiao’s knockout loss, that everyone seems to be wondering how the 34-year old will recover. We will find out when Pacquiao faces Rios in Macau, China on Nov. 23 and Roach insists he still sees the Manny of old when around his fighter and friend.